I've had a lot of trial and error in developing my super smoothie. I think I've finally settled on a tasty, healthy, super smoothie recipe. Here's what I put in, and why. Half a container of plain Greek yogurt: Probiotics, calcium, potassium, protein, zinc, and vitamins B6 and B12. This provides a base for a nice thick smoothie. Two handfuls of baby spinach OR two frozen spinach cubes: Getting extra veggies in the form of a smoothie is healthy and tasty. Spinach is constantly on "super food" lists. It provides anti-cancer qualities, Vitamins A and K, and fiber, among many other benefits. A cup of frozen fruit that generally includes strawberries and blueberries: fiber, antioxidants, Vitamin C.
One banana, fresh or frozen (I freeze them myself): I HAVE to have a banana in my smoothie. If there is no banana it doesn't have the thickness or sweetness that I like. Bananas are high in potassium, and great for cramps/pain from workouts and PMS. 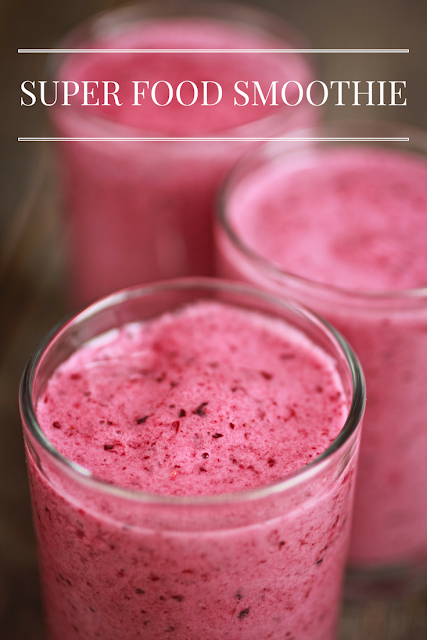 One tablespoon of honey (sometimes): I only use honey if the berries I've chosen make the smoothie too tart. One tablespoon of flaxeeds: Reduces risk of cancer and diabetes, fiber, and omega 3 fatty acids. 1/2 teaspoon of Matcha Green Tea powder: Super antioxidants and energy booster. I would like to try this. I am a smoothie newbie. Just checked the link for the spinach cubes. And, using frozen berries would help with the cold. This is great. Gotta make it happen. Smoothies are really awesome. Starting out with just berries and a banana is a tasty, simple way to go. Where do you get your Matcha? Have you ever tried making green tea lattes with it? I used what I had, but followed your concept. Kale, Pineapple Aloe juice, Blue berries, Cantalope, Beets, Beet juice, Lemon juice, & Chia seeds. It was fantastic. Thanks for the recipe. I'm glad it worked for you Anna! I love having smoothies for breakfast and these healthy ingredients are perfect! Really good start to the day. Yum! This looks delicious and definitely not spinach-y, which is something I can do!